Sharks with frickin' laser beams attached to their heads! In all fairness, the 50mW laser beam on the shark seen here to the right is not actually on its head, but rather clipped to its dorsal fin - which is close enough, really. The stunt was the work of marine biologist/nature show host Luke Tipple and Hong Kong-based laser manufacturer Wicked Lasers, to test a "clamping apparatus" that Tipple had invented. Frankly, if you want to test a device that clips something to something else, you might as well test it on the apex predator of the ocean. Initially, says Tipple, he was against the idea, considering it a frivolous stunt. But when he realized that it could be a way to test his clamps - normally used for actual scientific equipment - he reconsidered, reports Wired. "It was a low-powered laser that couldn't be dangerous to anyone, and there's actually useful applications in having a laser attached to the animal." Believe it or not, Tipple's "useful applications" have nothing to do with the sheer coolness of laser-beam-sharks. The laser helped monitors track the shark's velocity and trajectory relative to a target in real time, he said. "You can get a very clear description, via the laser, of what the shark's body is doing." Beyond that, he had hoped to test anecdotal evidence that sharks were repelled by laser beams of certain colors and wavelengths - only to find that the opposite was true. 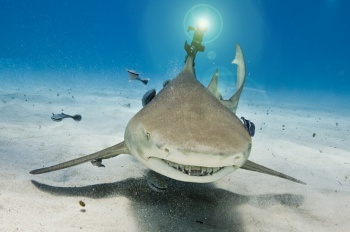 Sharks were actually attracted to the Wicked Lasers light, which means that anyone intending to use laser beams to fight off sharks in a scuba-diving scenario would probably want to reconsider. Though Tipple stressed that the experiment posed no threat to the shark at all - the new clamp is designed to be as non-invasive as possible, after all - and he does have the credentials to back his claims up, some have disagreed with the experiment. "[If] this is just to respond to a scene in the Austin Powers movie, I don't see value," said Rosenstiel School of Marine and Atmospheric Science assistant professor Neil Hammerschlag. "You're just causing unnecessary stress on the animal. It's not respectful." He did, however, agree that the clamp seemed the right way to do it. Meanwhile, Wicked Lasers was warning about another threat, as of yet unforeseen by any qualified biologists - the danger that sharks could figure out how to turn their laser equipment against others. "Depending on the power of the laser that they are armed with, the sharks could be significantly more dangerous," said CEO Steve Liu. "If there was a way the shark could operate the laser on its own accord and use it against humans, we wouldn't even attempt this."